A New York Times article today noted the rise in influence of Asian-Americans in philanthropy. It has some weird stuff about Asian cultures having a tradition of giving to charity, which as far as I know may be made up. But the point remains that any time you have a growing community of new money, it means new money to give away. But what America’s elites should really fear is the inevitable result of trying to close the doors on others: political backlash. 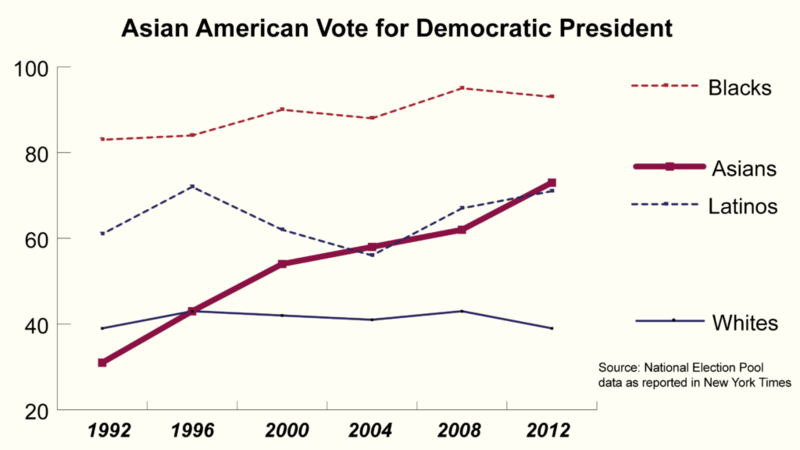 Asian and Pacific Islander voters went even harder for Obama last year than Latinos did. That’s more than double the 31% of Asian-Americans who supported Clinton 20 years ago. Political analysts are dumbfounded– shouldn’t any group with high average incomes vote Republican out of basic self-interest? In the aftermath of the election they scrambled to come up with all kinds of stupid explanations– Asian culture is collectivist not individualist, Asians like science and the GOP is anti-science, Asians mostly live in liberal coastal cities like SF and NY– none of which makes sense, since it doesn’t explain the shift over the last 20 years from Asian-Americans being conservative voters in the 1990’s. My theory is that this trend is being driven by younger second-generation API folks who have grown up within the context of America’s racial politics. Most countries have some kind of left/right political divide, but America’s left vs. right is deeply rooted in race in a way that isn’t as intuitive to new immigrants. You also see this among Latino immigrant communities, where US-born Latinos are more likely to self-identify as “liberal” than their parents. Even if you might have been a conservative in another country, for a person of color in America it takes about 10 minutes of watching Glenn Beck foam at the mouth about Obama’s plans to destroy white America to realize you’re not welcome at this particular tea party. The more familiar you are with American political culture the more likely you are to notice that American conservatism has a racist, exclusionary undertone in a way South Korean or Taiwanese conservatism probably does not. According to the National Asian American Survey, taken in late September, young (under 35) Asian-Americans were nearly twice as likely to support Obama as their parents’ generation, and also less than half as likely to be undecided on who to vote for. I predict eventually Asian-Americans will occupy a strange political space similar to Jewish-Americans. (Jewish voters have overwhelmingly backed Democratic candidates as far back as data is available). Asian-Americans will also become a group who, despite high average incomes that might otherwise predict conservative leanings, consistently vote Democratic and are heavily represented among prominent progressive activists, academics, politicians and donors. Money brings political clout. And you can bet that growing philanthropy mentioned above is not just funding universities and soup kitchens, but candidates and advocacy organizations too. And because many API advocacy groups are not ethnic-specific but work on behalf of API Americans as a whole, they often take strong social justice stances because of the many smaller API ethnic groups and older immigrants who are low-income and politically disenfranchised. Like Jewish-Americans, Asian-Americans will likely have an influence on politics larger than simple numbers as voters. But the numbers will be important too. 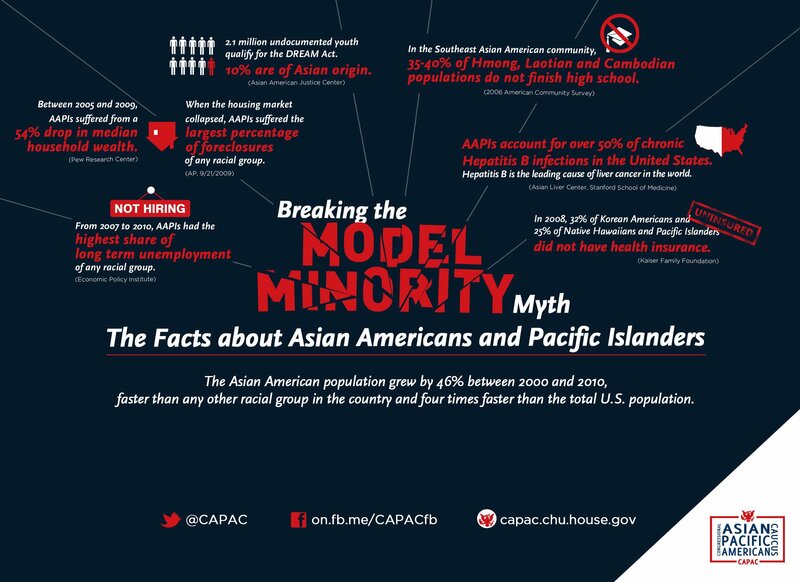 Asian and Pacific Islander Americans are now the fastest growing racial group in America. Jewish people make up only 2% of the U.S. population, much less even than the current API population. But Asian-Americans are expected to grow to 9% of all Americans by midcentury. That’s nearly the size of the current black population. In fact, Asian-Americans will be the fastest-growing, wealthiest, and most rapidly leftward shifting group in America, all at the same time. And that’s bad news bears for the right wing. Was the Fiscal Cliff Deal, Weirdly Enough, Occupy’s First National Victory?